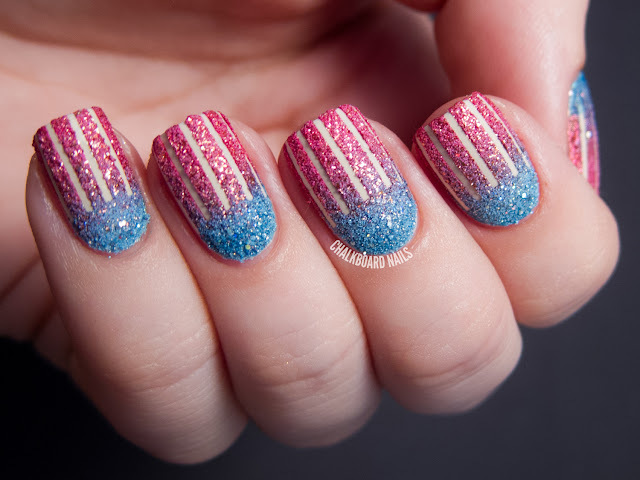 I don't follow a lot of tutorials when I do nail art, but damn I really should! There are so many awesome tutorials out there and I had a lot of fun picking out what I wanted to do today. 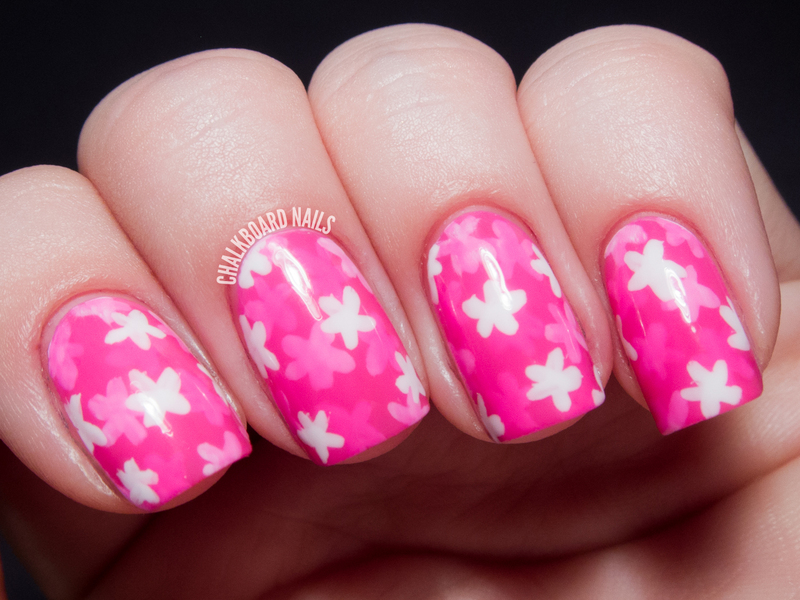 This style of nail art is called a "pond manicure!" It doesn't so much reference an actual pond so much as it references the depth and the layers of the design. I followed a tutorial from Jacki at Adventures In Acetone, and she credits Olive View Fashion as the originator of this technique. It's genius and gorgeous and best of all, EASY! Sarah's Answer: I don't really do anything differently, other than maybe apply extra moisturizer as needed! It's already pretty dry here most of the time so the winter doesn't bring too much of a change. 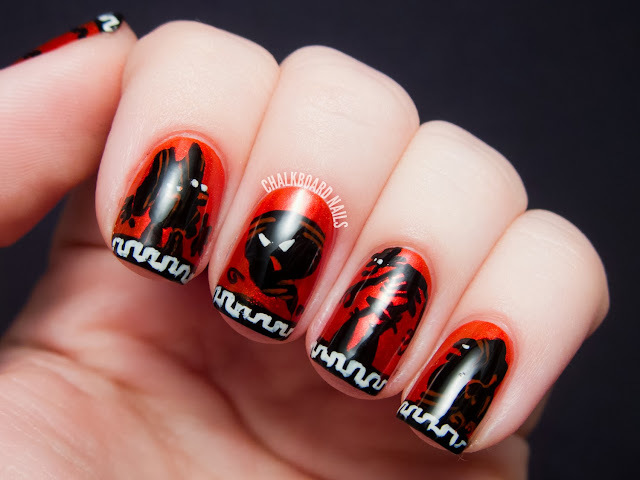 Chalkboard Nails - Disney fans will recognize the Titans in this Hercules nail art -- thankfully, Zeus has let me borrow his thunderbolts to keep them in check! Clumps of Mascara - changed her hair. Yes again! Check out what she did. EauMG - This perfume sets the scene for a Lovecraft tale. Here’s a deep patchouli scent by Roxana Illuminated Perfumes. Gouldylox Reviews - Want waves that last through sleep and a trip to the gym? This mineral totally worked for me. My Beauty Bunny - is gearing up for the BeWell Beauty and Wellness Expo coming to Pasadena this October. Want to win tickets and a swag bag worth $300? Of course you do. Stop on by and enter! Nouveau Cheap - I rarely declare something a new “Holy Grail” product, but in the case of this facial cleanser, it’s so good that I haven’t wanted to reach for something else in months. 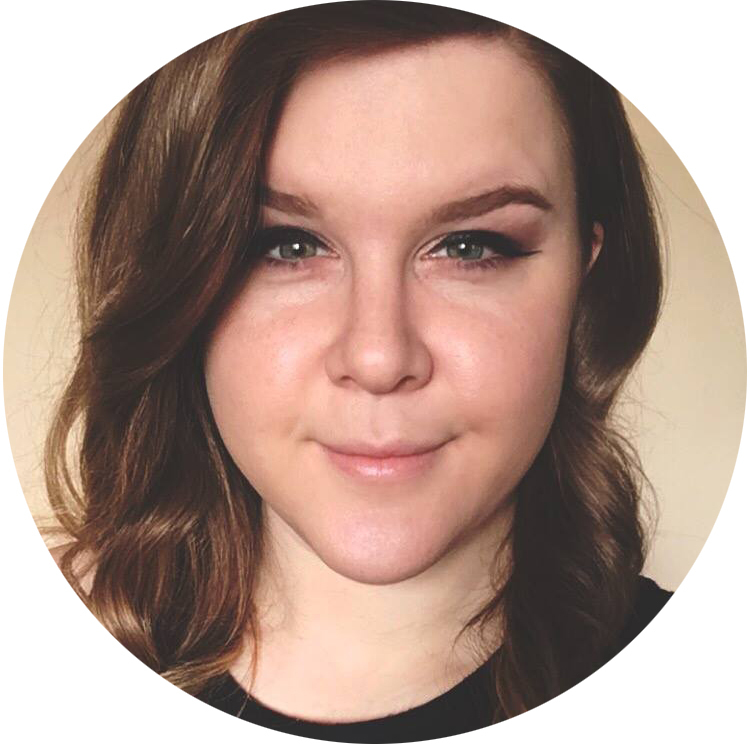 Pink Sith - thinks raindrops on roses and whiskers on kittens is cool and all, but she would rather tell you about her favorite Oils for face, hair, nails and body. 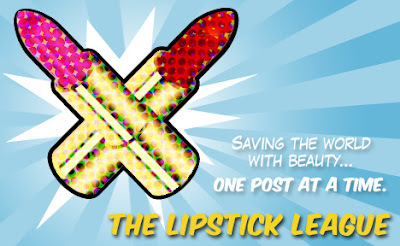 Prime Beauty - and other top beauty bloggers give you a peak at what's in their purses! Phyrra - tells you how to get sublime skin with Cover FX CC Cream Time Release Tinted Treatment SPF 30! Beauty Junkies Unite - Check out the review & swatches for new Breast Cancer Awareness collection from OPI, Pink of Hearts 2013! 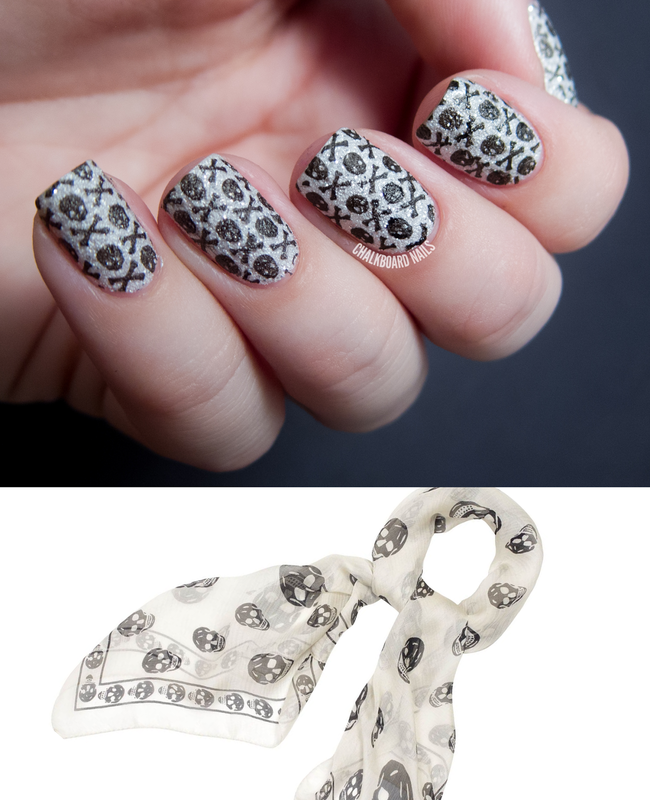 Guest Post of the Week, as chosen by Chalkboard Nails - Nail Polish Society shows us her sweet-yet-tough manicure, complete with glitter that has been hand placed in the shape of a skull and crossbones! I struggled a little bit with this prompt today... I swear I almost did Duchamp's "Fountain," which I threatened to do last year. But again, I wanted to do something a little more interesting and a little less related to urinals. In the end, I arrived at doing a KAWS piece. 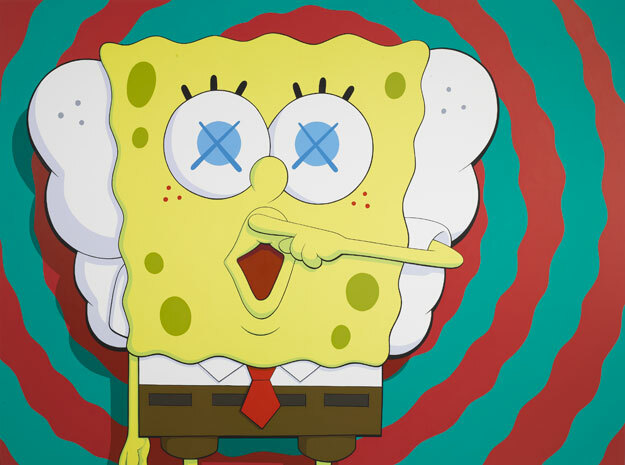 KAWS is an artist that deals a lot with very recognizable cultural icons, cartoons in particular, and one of his subjects is Spongebob Squarepants. 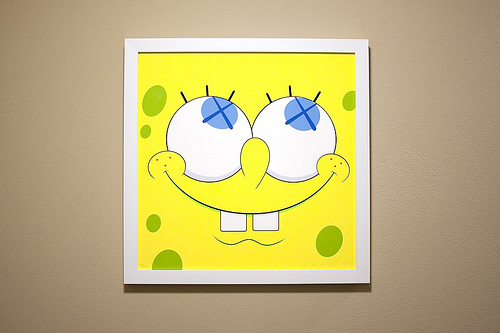 I already like Spongebob is a non-ironic way so I thought it would be fun to recreate him in KAWS's style. 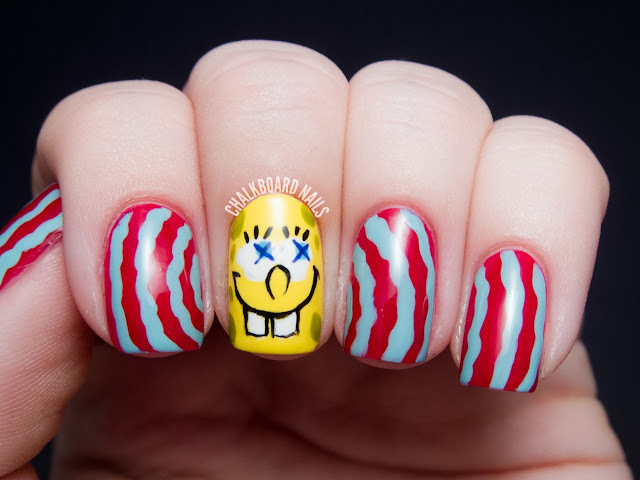 ...and Spongebob's face from this second one. Unfortunately, my Spongebob's face ended up a little bit longer than the one in the piece, so he is less "on the money," if you will, but after having redone him three times I figured it would work well enough! The base of the wiggly spiral nails is COVERGIRL Ever Reddy, while the actual wiggly spirals were painted with China Glaze For Audrey. 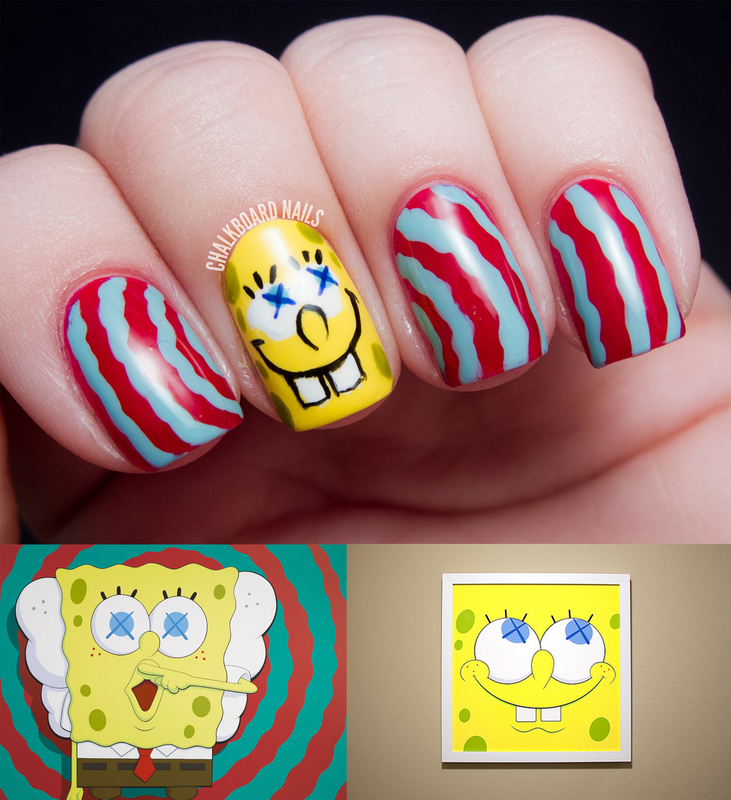 Spongebob's base color is China Glaze Happy Go Lucky, while his eyes are painted with Zoya Rocky and the Xs painted with OPI...Eurso Euro. The sponge holes are China Glaze Budding Romance. The black I used is American Apparel Hassid and the white is Zoya Purity. 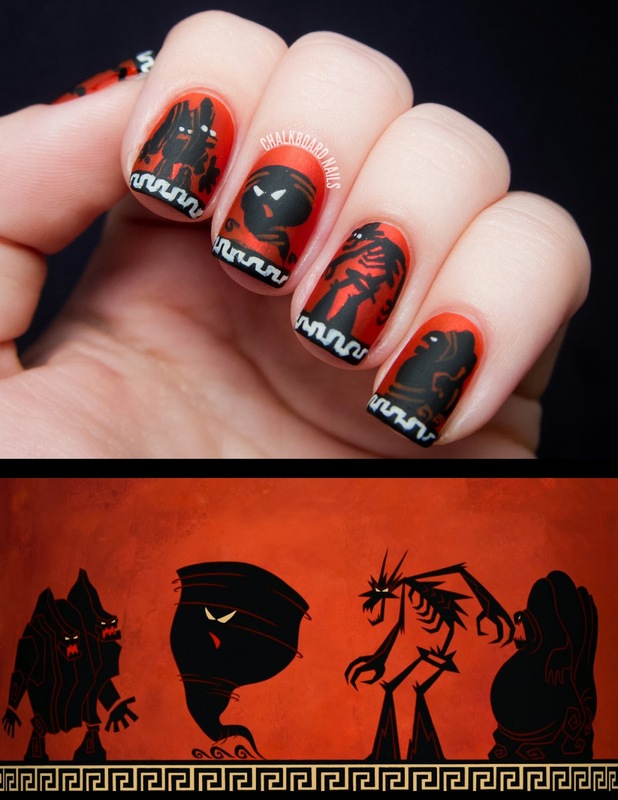 I love the extreme contrast between the two different nail styles here. They look like they don't go together at all, but in a wonderful way. 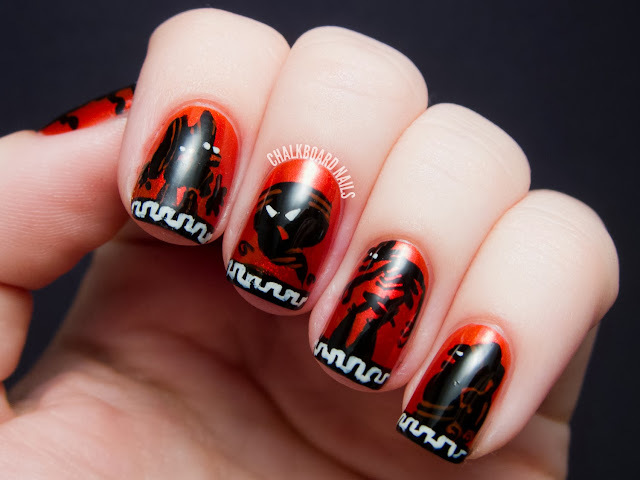 My artwork nails from 2012! My artwork nails from 2011! 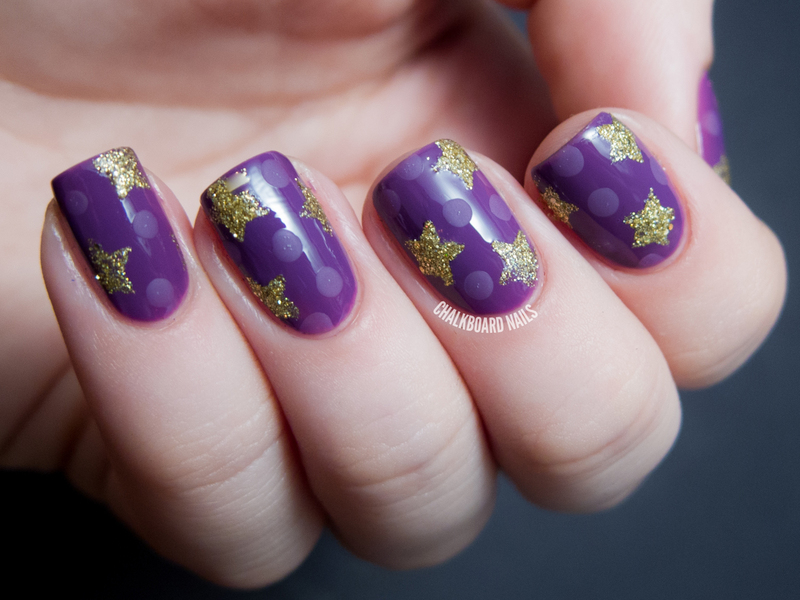 It's #ThrowbackThursday, and for today's pattern manicure, I thought I would draw inspiration from an older post. 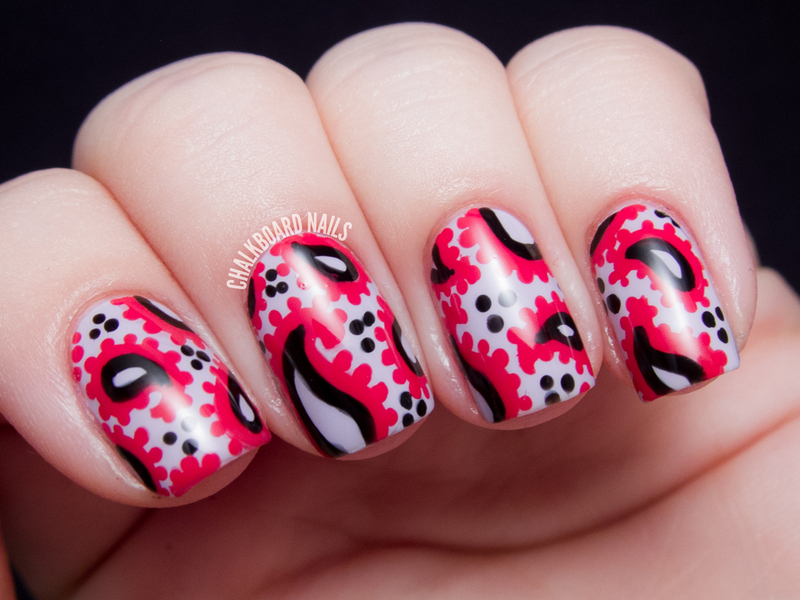 Way back in November 2011 I attempted my first paisley manicure. I definitely knew that I would be able to improve on my look from back then, and so I set out to do it! For this look I used three COVERGIRL Outlast Stay Brilliant Nail Gloss shades. I had actually never tried CoverGirl polish before this so I was definitely eager to give them a spin! The base of the manicure is COVERGIRL Lav-endure. 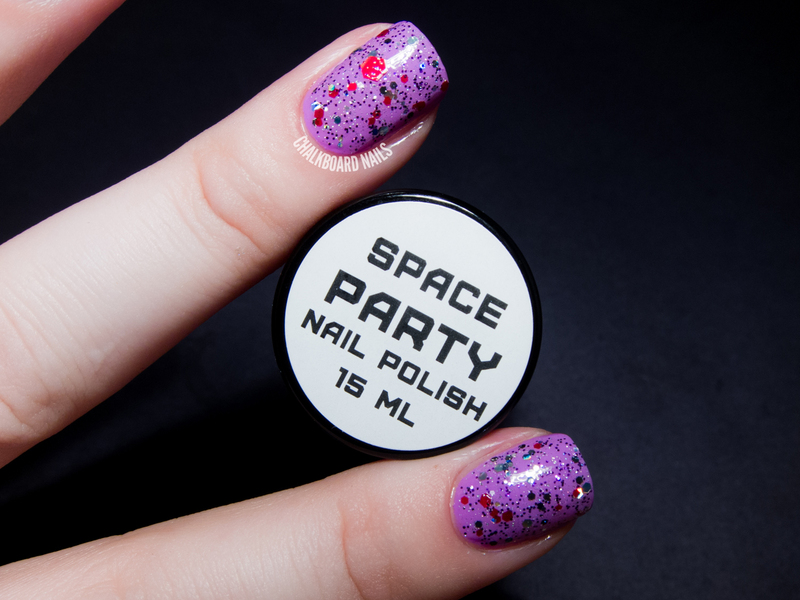 This light purple shade is subtle and pretty, and only required two coats for opacity. The formula was on the thinner side, but not runny. I was pleased! The majority of the paisley design was handpainted using COVERGIRL Reliable Red. This bright, almost pinkish red was nice and opaque, and flowed well in the nail art. The black accents were painted with COVERGIRL Black Diamond. It's definitely not the most opaque black I've ever used but it got the job done, to be sure. For those of you interested in checking out the line, COVERGIRL polishes can be found in drugstores and other large scale retailers for around five bucks each. I love the way these colors paired together and I definitely can say that my paisley skills have improved since 2011. Gotta love #TBT! 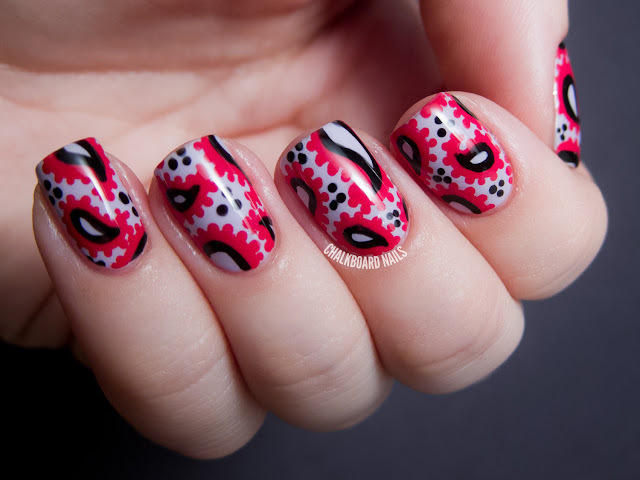 Have you ever rocked a paisley nail art design before? If not, would you? My patterned nails from 2012! 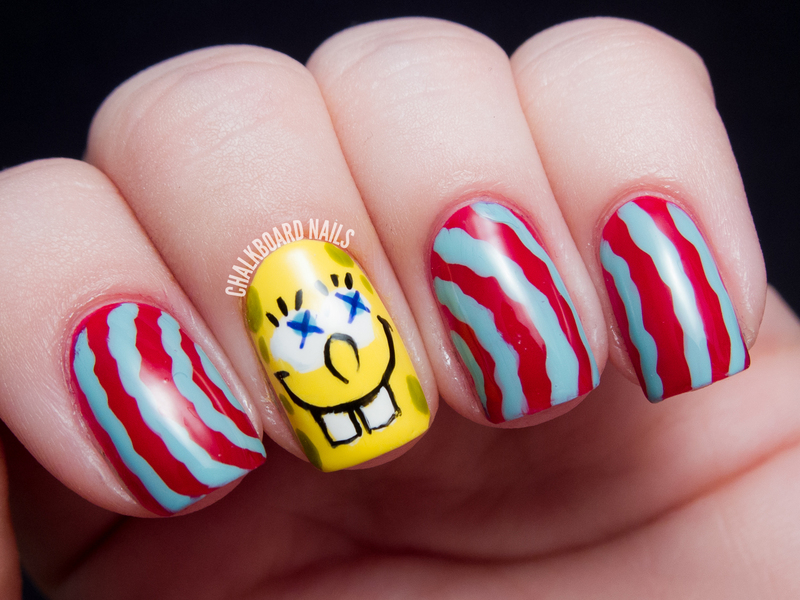 My patterned nails from 2011! This prompt usually stumps me every year. While I do think that I have a decent amount of style, I'm not so up on exactly what's going on in the world of fashion. HOWEVER! 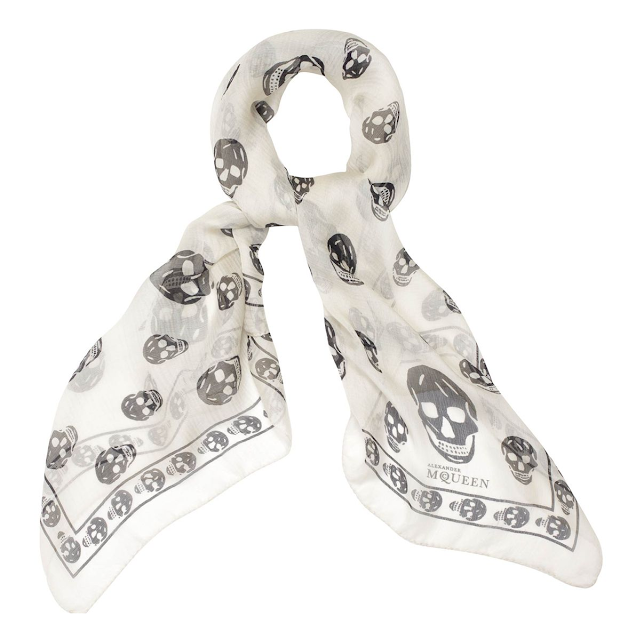 One item I did recall when brainstorming for today's post was the Alexander McQueen Skull Scarf. Well, I didn't recall that it was specifically a McQueen piece, so I googled "black and white skull scarf" and connected the dots from there. See, I told you I don't know fashion! For my manicure, I started with a base of three coats of OPI Solitaire, a white Liquid Sand polish with small silver glitters. After letting it dry completely, I stamped on a pattern from Vivid Lacquer plate VL001 using Essie Licorice. This was my first time stamping on a textured polish! It went just as well for me as any of the other stampings I've done, which is to say I had to fill in a couple of spots freehand. I've gotta stamp more often so eventually I won't have to do those touchups anymore. I do like the way the stamping looks on the textured polish -- very unique. Collage image, you know the drill! 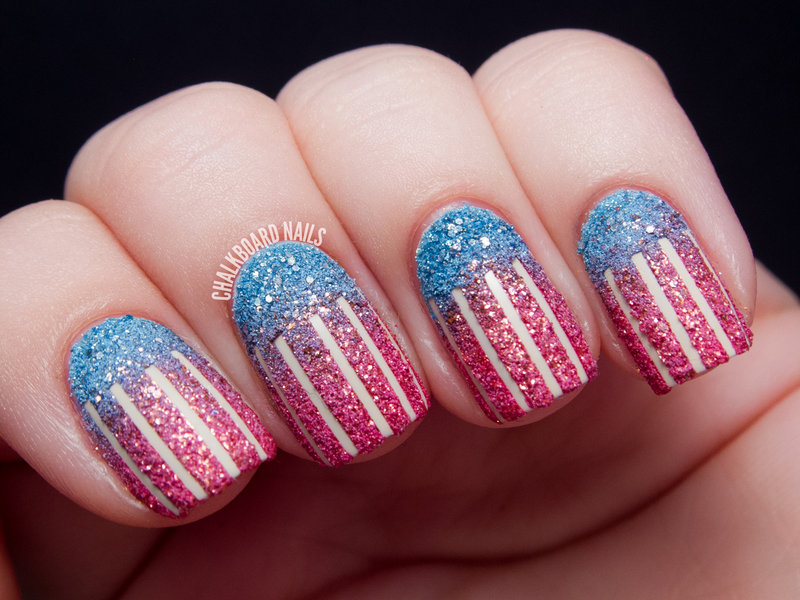 My inspired by fashion nails from 2012! 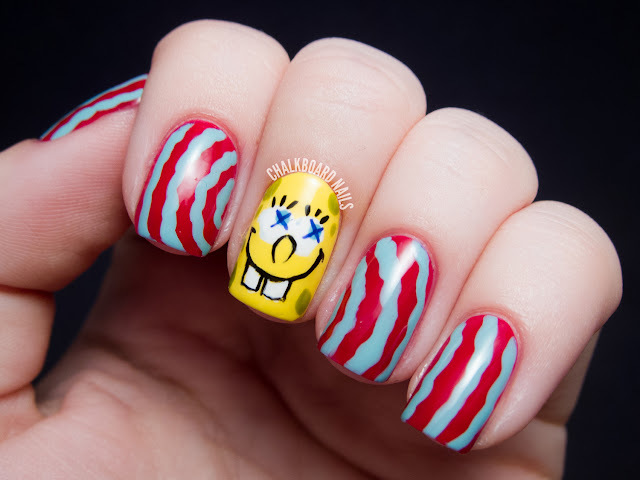 My inspired by fashion nails from 2011! 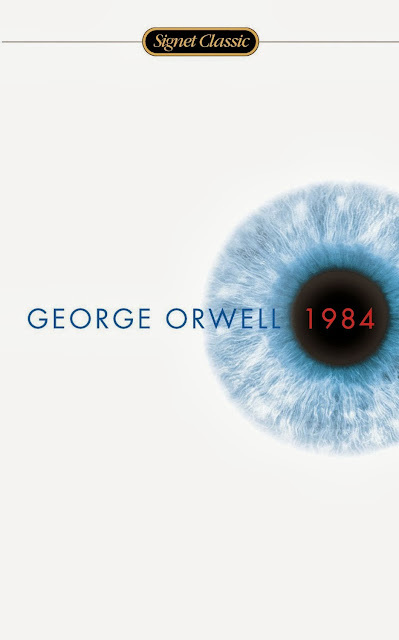 One of my favorite books is George Orwell's 1984. Since I'm sure many of you have read it, I'll try to keep my summary as brief as possible! This novel, written in 1949, is about a dystopian future where the government is everywhere and watches everything that its citizens do. One of those citizens is Winston Smith, a man who works for (but secretly hates) the government. Winston ends up falling in love with a woman and the two of them have a rebellious affair, but they have to deal with the consequences when the ever-watchful Big Brother finds out. A huge theme in the book is the pervasiveness of government in every aspect of these peoples' lives. Big Brother, the face of the political party, is touted as "always watching," and controls what the citizens are and aren't allowed to do. My copy of this book, shown below, has a single blue eye on a white background. I decided to take that idea to the extreme. This is the copy of the book that I own. I think I've read it at least five times. If you never had to read this in school (or for fun), I highly recommend it. 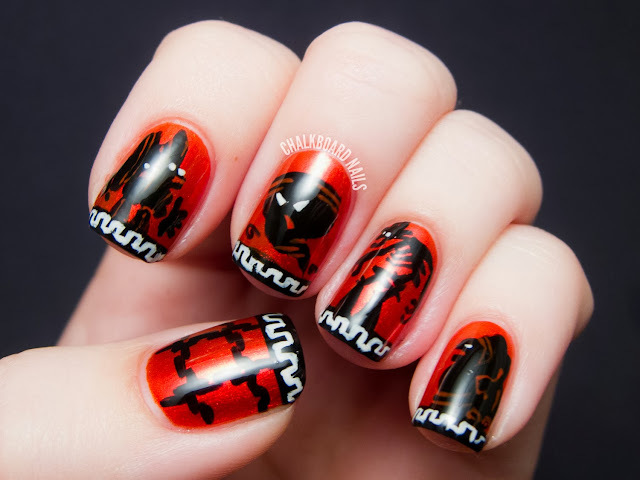 This manicure is actually quite similar to one of the oldest tutorials on this site, a Halloween design I did that is creatively titled "Eyeball Pattern." For the large blue dots, I used the rhinestone picker that I used in my 31DC2013 dot manicure. Remember, you could also use a pencil eraser as a substitute! Big Brother is watching you. Especially with this many eyeballs. Of course, the obligatory pinnable combo image. 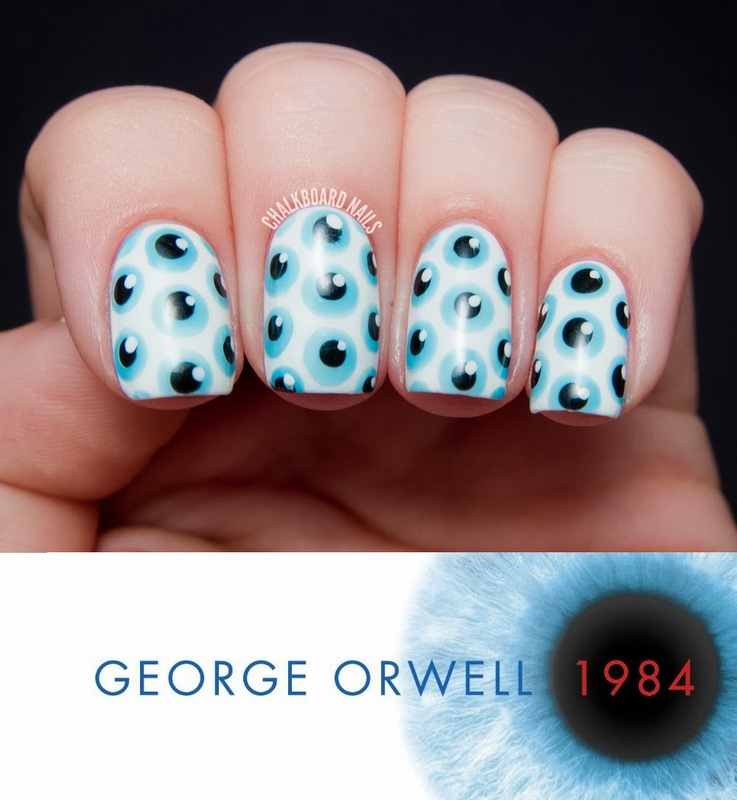 Have you read 1984? What did you think? 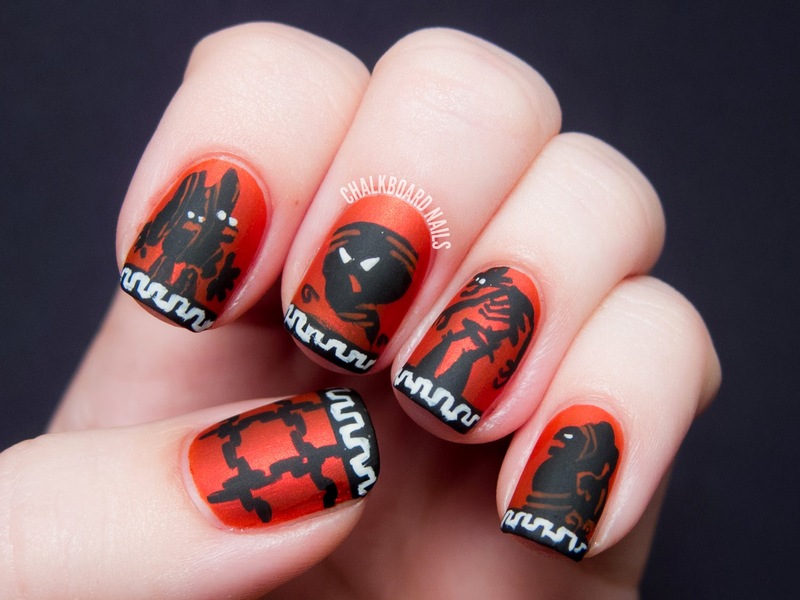 My inspired by a book nails from 2012! 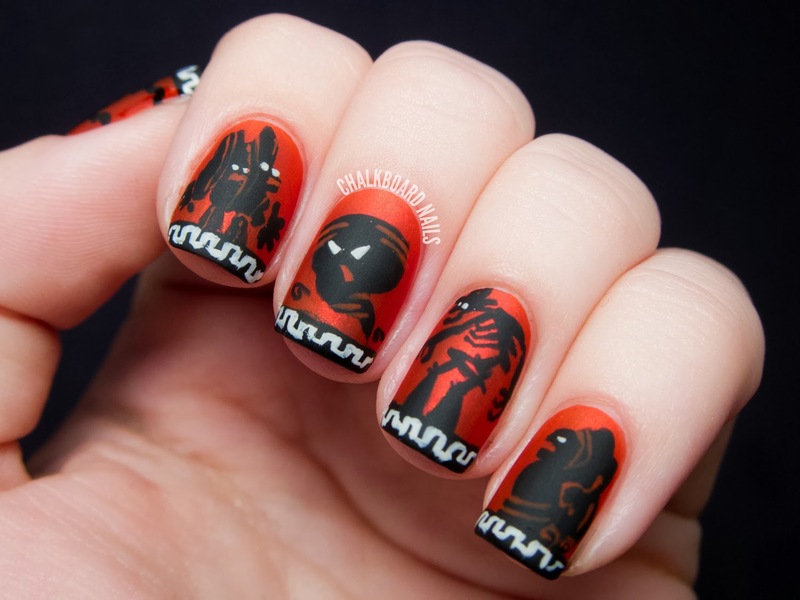 My inspired by a book nails from 2011! 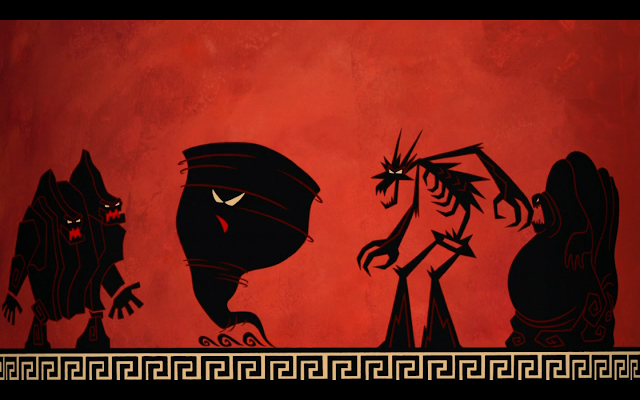 I have a deep love affair with Disney movies, and one of my favorites is Hercules! 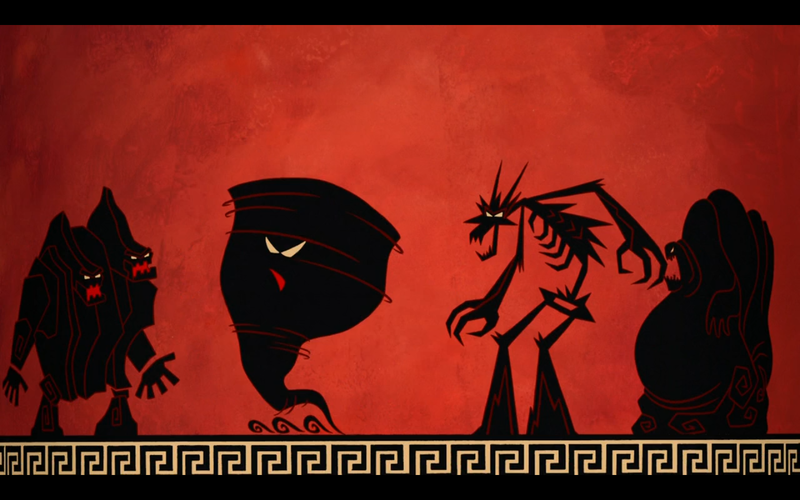 In the beginning of the movie, the Muses, who are the storytellers, give you some background on what's happening by showing short, stylized animations as if they were coming to life on Greek pottery. If you haven't seen the movie, you can check out what I'm talking about here (my specific inspiration starts around 1:20 in that video). So what I've shown are the Titans from the movie! Rock, wind, ice, and lava. On my thumb, I've depicted the thunder bolts that Zeus uses to trap the Titans in the ground. 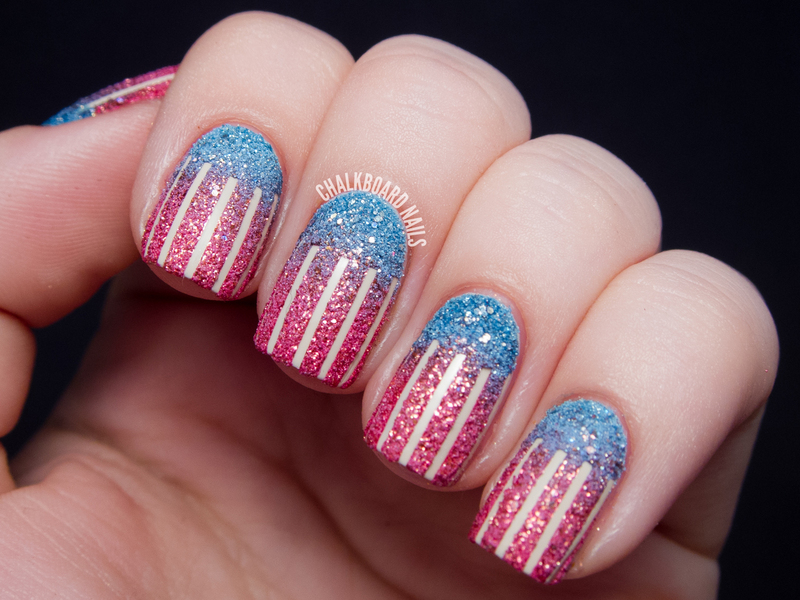 The base is China Glaze Bend Over Backwards, a glowy red-orange that matched the inspiration image beautifully. The Titans are freehand painted with Essie Licorice and the white pieces were done with Color Club Mod In Manhattan. For the matte photos, I added OPI Matte Topcoat. I personally prefer the matte finish for this particular manicure because it gives a more antiqued finish. The modified Greek key French tips look a little shaky in macro photos, but I think they look pretty solid in person! 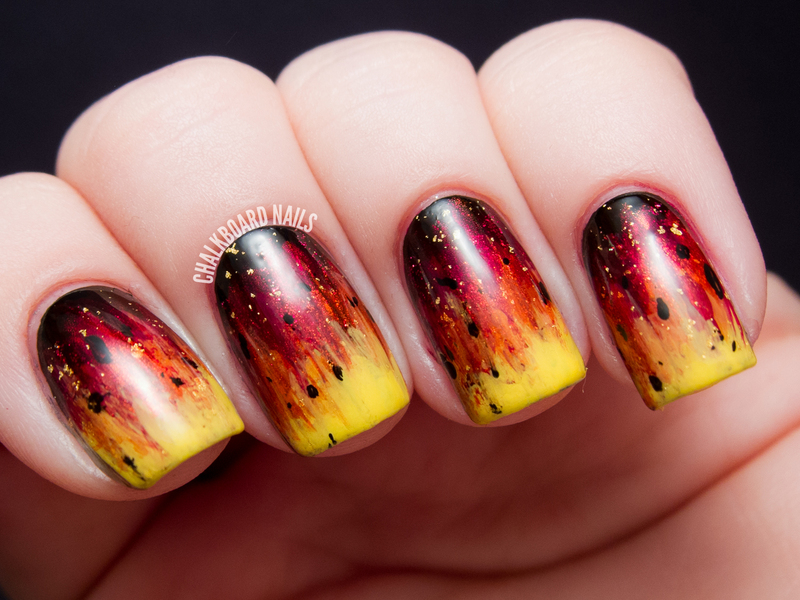 With topcoat, the base polish looks super glowy and the black looks bolder and more contrasting! Which way do you prefer it? Here's a combo for your pinning pleasure! 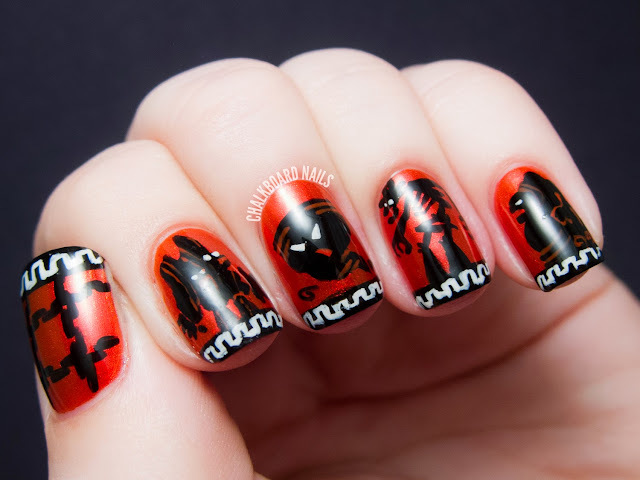 My movie nails from 2012! 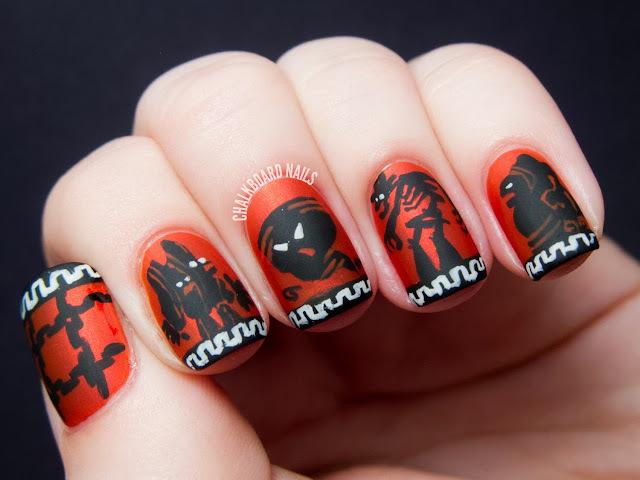 My movie nails from 2011! You go Glen Coco! Today's nail art is another variation of my sugared stars technique, except instead of a textured polish, I used a dense glitter. Make sure to visit the tutorial for details, and read on for the polishes that I used in this specific look! I began with a base of Precision Nail Lacquer Pur-fect FX, a pretty rich purple shade. This was my first experience with Precision Nail Lacquer and I have to say I was really impressed! The formula was nice and the color was really pretty, plus the polish dried super glossy on its own. Then, after letting the base dry completely, I applied painter's tape that had been punched with the stars. I sponged on a couple of rounds of Cirque Helios, a sparkling gold with holographic glitters. I chose to leave it without a topcoat, which gave it a sandy, finely textured effect. The final step was using OPI Matte Topcoat to add some dots in the negative space. As you can see, this matte topcoat is SUPA DUPA MATTE, providing a great contrast with the base of the manicure. I don't do enough matte and glossy combination manicures. They look so legit! They're subtle but bring that extra bit of oomph. Inspired by a song! Today was another one of those challenge days where I was completely uninspired. My first thought was to do some palm tree silhouettes over a sunset gradient to represent Will Smith's "Miami," and while I actually completed a full version of the manicure, I wasn't thrilled with the way it turned out. 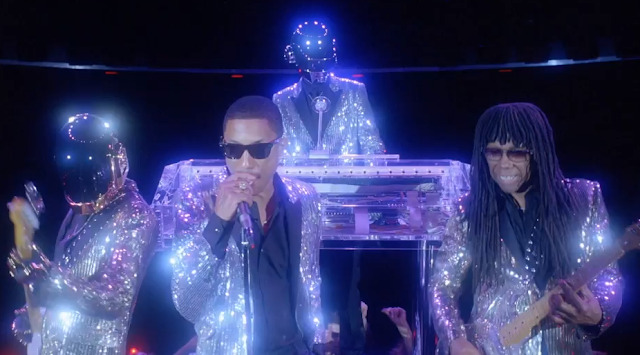 Luckily, Miss Rebecca came to my rescue, suggesting that I mimic the sparkly suits from the music video for Daft Punk's "Lose Yourself to Dance." You can't go wrong with crazy amounts of silver and glitter, so I went for it! 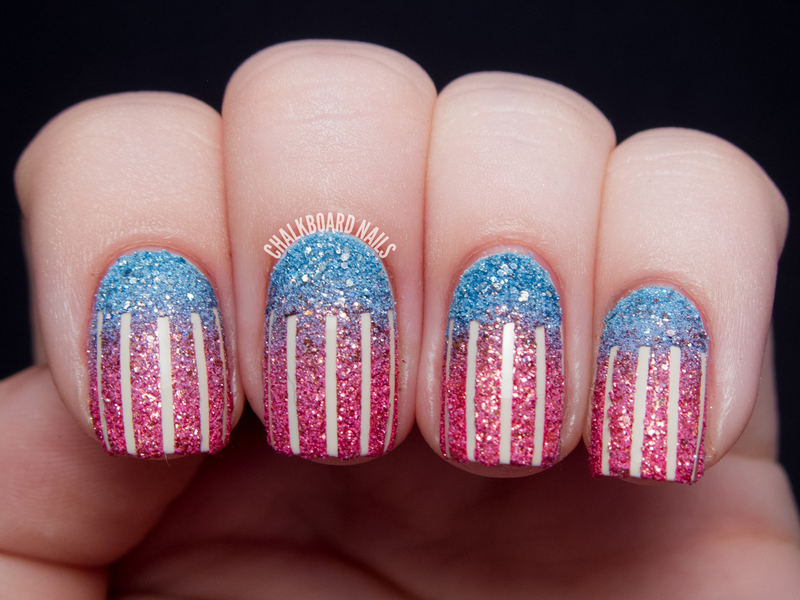 By the way, you NEED to look at Rebecca's "inspired by a song" nail art for today. Brilliant. Here's a still from the music video. SEE THE SPARKLE!? 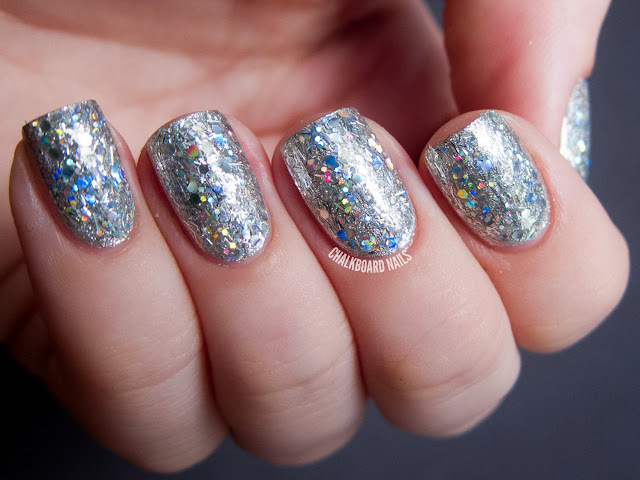 There is so much holo glitter in this manicure... no matter which way I turn my nails, it's always catching the light like crazy. BAM. One can never post too many pictures of glitter. My inspired by a song nails from 2012! My inspired by a song nails from 2011!